We are in the middle of our mosquito season and with the unusually warm season and the recent rainfall they are abundant. This year, to date in Rhode Island, no mosquitoes have tested positive for West Nile Virus or Eastern Equine Encephalitis. West Nile Virus, while it hasn’t been found in the state this year, is clearly in our region and has been recently isolated in Boston, Stamford, Connecticut and Long Island. In addition, EEE was recently isolated in mosquitoes trapped in Lakeville, Carver, and Easton, Massachusetts. 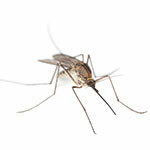 Mosquitoes are trapped every week statewide by DEM staff and tested at the RI Department of Health (HEALTH) laboratory. DEM will normally report mosquito test results once a week on a routine basis, with additional reports as necessary. Positive mosquito test results will generally trigger additional trapping to assess risk. For those people who want to enjoy there yards, decks and pools throughout the summer season they have the option of hiring a pest control company to treat the yard to eliminate mosquitos. To maintain the yard over the season it would have to be treated every 3 weeks. SHS uses green products to treat mosquitos for those who do not want pesticides sprayed in their yards. Choose whatever options that you are comfortable with but if you’re not being bit by mosquitos you’re not contracting the diseases they carry, it’s that simple.